I don’t think of myself as a phony person. Yet I’ve gone to the dark side, or maybe that’s the light side, of fakeness. This metamorphosis began during my Stonecoast fourth semester in the low-residency MFA program in Maine. I’m only there for ten days each semester, then home to do the hard writing. 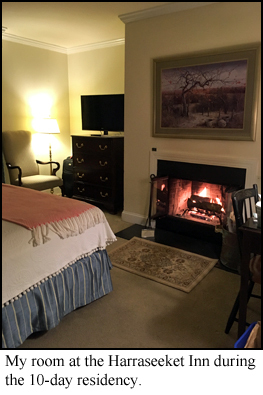 At the January residency, students are housed at the Harraseeket Inn in Freeport, and this time I was assigned a room in the old section with a wood-burning fireplace. Some wonderful person filled the copper firewood bucket each morning and even laid up a fire. All I had to do was strike a match to light it. I went to bed by firelight, flames flickering, dancing light on the walls. I loved that fireplace. It cheered me up. It gave that room a cozy feel, not like a stark hotel room at all. While lying there enjoying the light show, I thought about our living room fireplace insert that had not been used in years. 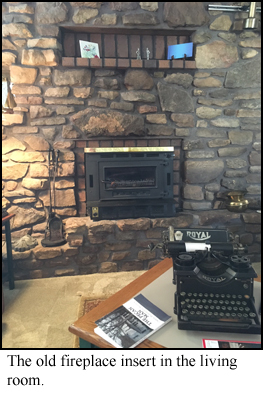 I have daily wood fires in the big room, but not in the smaller living room where the TV is, and really, that’s where I read and where I spend evening time now. Jim and I used to spend hours staring into the flames in the big room, talking about the vast universe and our places in it, talking about how a person builds character, talking about the extra color that birds see, or paint chips, or should we have some ice cream. I use that room now when friends are over, but it’s too big for me alone in the evening. Back in Maine a light bulb (or flame) went on over my head, and I decided I needed flames in the living room at home. 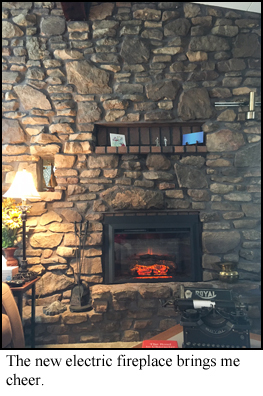 The glass on the fireplace insert in that massive stone wall coated over with black creosote within an hour of lighting the fire, so flame time was limited, and I had to scrape the glass with a razorblade to clean it before the next fire. It also had a noisy blower. And it drew air from the stairs going to the lower level, so it created a draft about foot high. Converting to gas was not feasible. There are no gas lines to this level of the house, which is slab. Breaking up the living room floor was not an option. So…. I now have an electric fireplace. I know, I know, I know. I know it’s fake, but I don’t care. This from a person who waters dozens of houseplants twice a week. I like real things like live plants, not things like fake greenery. But I’ve transformed. This fireplace is magnificent. Realistic flames at the flick of a remote control. Heat when I turn on the quiet blower. It does not become opaque glass within an hour. It does not create a draft from downstairs. It does not require carrying wood and cleaning out ashes. It changes the living room into a cozy area. Flames bring me cheer. Candle flames bring me cheer, but I don’t often think to light candles, and I have to remember to blow them out or there could be consequences. So there you have it. I’ve become a bit phony, but I prefer to call it becoming more creative. I’m using my imagination to see real flames. Watching them lets my mind drift, not dwell. Flames bring good cheer. P.S. I know what you’re thinking, and I am not an arsonist. Okay, I did accidentally set the woods behind our house on fire years ago, but that’s another story.